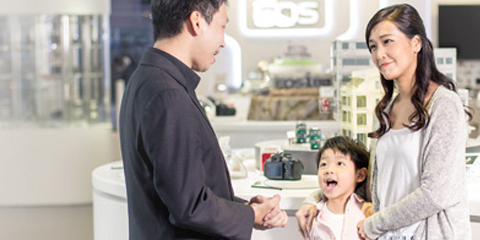 Upon receiving the Product(s) from the Customer or accepting the quotation by the Customer, Canon Hongkong Company Limited (“CHK”) will issue a Repair Service Order to the Customer subject to Clause 2 below and may carry out whatever repairs and replacement of defective parts deemed necessary. For Products that are outside Warranty or extended Warranty, Customer shall pay the inspection fee before the issue of the Service Order. The Inspection Fee is non-refundable under any circumstances. After repair of the Product(s) or replacement of Parts thereof, the amount of the Inspection Fee (if any) and/or any pre-payment of repair charge (if any) will be deducted from the repair charge payable by the Customer. The Customer will be required to pay the balance of the repair charge upon collection of the Product(s). In the event that CHK decides to replace or repair the defective Products or any parts thereof (no matter the defect is stated on the Service Order or not), CHK shall notify the Customer of the costs of the repair or replacement and seek the Customer's consent of the proposed repair or replacement. CHK makes no warranties, express or implied that the repair or replacement of Products or parts thereof is of merchantable quality or for use and fit for a particular purpose. The production of the Product, its accessories and spare parts have been discontinued. Unless the product is repaired under warranty or extended service warranty without charge, the Customer shall pay CHK the actual Repair Charge. The Customer’s payment is due when the Product is returned to the Customer. All payment shall be made in Hong Kong Dollars in cash or by credit cards. Payments by cheques will not be accepted. CHK will perform repairs of the damaged parts as described in the Service Order. If the Customer has not specified the repair, the Customer shall nevertheless be liable for the repair charges incurred by CHK as considered necessary at CHK’s sole and absolute discretion. CHK shall not be responsible for any breakdown of the Product caused by any non-Canon hardware or software related problems or any damage or malfunction to any accessories which are connected to the Product. Provided that the Customer has settled the Actual Repair Charge, the warranty period of the Product will be extended for a period of one month (or in the case of camera and video products, three months) for a recurrence of the same fault after the collection date , subject to these Terms and Conditions save and except this clause, the terms and conditions of warranty and the terms and conditions of the EWSS. For the avoidance of doubt, this clause is not applicable to any Product covered by Product warranty or the EWSS. CHK may at its sole and absolute discretion impose additional charges on the Customer for cleaning and checking works, and parts. CHK shall not be liable to the Customer or any third party whatsoever for any damage, loss, liability (save and except for any personal injuries or death) including but not limited to any loss of or damage to data or software caused by any act, omission or negligence of any technician, employee or independent contractor of CHK or any events of Force Majeure. In any event, the maximum liability of CHK under the Service Order shall be restricted to the total amount paid by the Customer hereunder. 11. CHK will exercise every care to safeguard the Product(s) received but no guarantee can be given against loss and damage caused by circumstances beyond CHK’s reasonable control including, but not limited to war, riot, strike, embargo, act of god, theft or government intervention. You shall bear the risk and be responsible for damage (such as the damage on the coating and surface of the lens) arising from the maintenance if you request to repair and clean the lens with filter or colour filter or other optical components. CHK may disassemble the product and reset its settings in the course of inspection, repair or parts replacement without prior notice to the Customer. Any damaged/defective part so replaced shall be CHK’s property and non-returnable. Before the inspection, you shall be responsible to ensure that all data stored in the external storage media or Built-In Memory has back up. Under no circumstances shall CHK be liable for any direct or indirect loss or damage or leakage whatsoever arising from the loss or damage of the external storage media or Built-In Memory or its data or copyright in connection with the inspection, use or maintenance of the external storage media or Built-In Memory. CHK reserves the right to refuse Customer’s request for the inspection on external storage media or Built-In Memory without giving any reason and prior notice. Customer must check carefully and confirm all items recorded on the Service Order, Canon shall not be liable for any loss, damages or claim of the attachments / accessories not recorded. CHK shall have the right to refuse the Customer’s request to collect the Product if the original Service Order is not presented. 15. Should the Customer fail to pay all the charges due and collect the Product within sixty (60) days upon being notified by CHK that the Product is ready for collection, CHK may dispose the Product in accordance with the applicable laws, CHK further reserves its rights to claim for any or all of the unpaid charges. 16. These Terms and Conditions are governed by the laws of Hong Kong, if any provision of these Terms and Conditions is held to be illegal or unenforceable, it will not affect the enforceability of the other provisions of these Terms and Conditions. 17. These Terms and Conditions can be varied unilaterally by CHK without notice to the Customer. 18. In case of any dispute, CHK reserves the right to make the final decision. 19. In case of discrepancy between the English and Chinese version of these terms and conditions, the English version shall prevail. These Terms and Conditions apply to the limited warranty ("Limited Warranty") from Canon Hongkong Company Limited ("Canon") in respect of Canon Camera Bags (model number starting with RL) ("Product") purchased from an authorized dealer of Canon in Hong Kong Special Administrative Region (‘Hong Kong’) and Macao Special Administration Region (‘Macau’), and accompanied with a proof of purchase (e.g. purchase receipt). The Limited Warranty covers defects in material and workmanship encountered under normal use and installation of the Product, subject to these Terms and Conditions. Unless otherwise specified, the Limited Warranty is valid only in Hong Kong and Macau. The Limited Warranty is valid only for the original purchaser ("Purchaser") of the Product and is not transferable. Unless otherwise specified, the Limited Warranty is valid for 60 months (5 years) from the Date of Purchase ("Warranty Period"). The proof of purchase is invalid if it has been defaced or altered. The proof of purchase must be presented when sending Product to Canon for the Limited Warranty services. The defective Product or parts thereof covered under the Limited Warranty shall be repaired or replaced (with comparable and/or refurbished product or parts) as determined by Canon in its sole discretion free of charge. Any insurance, handling, transportation, delivery and other incidental charges in respect of the servicing of the Product and for services beyond the scope of this Limited Warranty shall be borne by the Purchaser. All decisions made by Canon in respect of the servicing of the Product (including repairs, replacements or issues relating to defects of workmanship or materials) shall be conclusive and the Purchaser agrees to be bound by such decisions. Any defective Product or part thereof replaced shall become the property of Canon. (a) Loss or damage to Product arising from or in connection with (i) abuse, tampering, modification and disassembling by any person other than Canon's authorized personnel; (ii) negligence and/or misuse (including accident, improper storage, exposure to moisture, excessive temperature, sand, dust, dirt, other pollution or other environmental conditions and failure to follow precautions or proper operating instructions stated in the instruction manual such as improper installations); and/or (iii) fire, flood, lightning strike or other acts of God. (b) Loss or damage to Product arising from or in connection with the malfunction of, connection to or use of parts and accessories not authorized or recommended by Canon (including re-conditioned, tampered, re-used or non-genuine Canon parts and accessories). In such event, Canon reserves the right to cancel the Limited Warranty immediately. Non-Canon products and any other peripherals used in connection with the Product. 10. To the extent allowed by the applicable local law, the remedies in the Limited Warranty are the Purchaser's sole and exclusive remedies. Canon shall not be liable for loss of data or any incidental, indirect, special or consequential damages (including loss of anticipated benefits or profits) whether based on contract, tort or otherwise, relating to or arising out of the Product. Notwithstanding anything to the contrary, to the extent permitted by law, Canon’s total aggregate liability in contract, tort, equity or otherwise for any direct loss or damage arising out of or in connection with this Limited Warranty shall be limited to the replacement value of the Product. A person who is not the holder of the proof of purchase has no right at law to enforce any of these Terms and Conditions. No expressed or implied warranty, including that of satisfactory or merchantable quality or fitness for a particular purpose, applies to the Product after the Warranty Period. No other warranties (express or implied) or guarantee given by any other party in respect of the Product shall bind Canon. 13. Canon reserves the right to change or cancel these Terms and Conditions without prior notice. 15. The Limited Warranty including these Terms and Conditions shall be governed by and construed in accordance with the laws of Hong Kong. The courts of Hong Kong shall have exclusive jurisdiction to adjudicate any disputes arising from or in connection with these Terms and Conditions. 16. In case of any inconsistency or ambiguity between the English version and the Chinese version of these Terms and Conditions, the English version shall prevail.